This aerial view looking directly west to Gage Park shows the growth in the number of buildings in the Menninger East Campus. According to the notes on the back of the photograph, Dr. C.F. had this one on his desk for a long time. This aerial view of the early Menninger Clinic in Topeka looks north west with the junction of Gage Blvd and Sixth Avenue in the upper left corner. 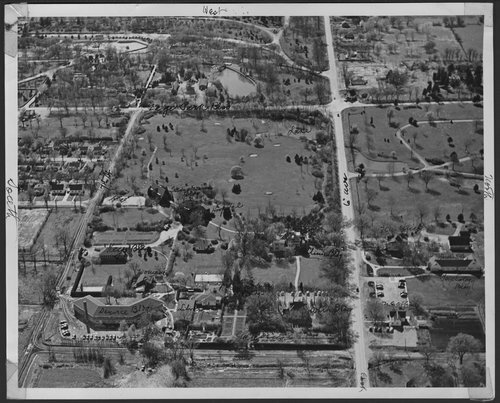 This black and white aerial view is of the original Menninger Sanitarium. Dr. C.F. Menninger and his sons, Dr. Karl and Dr. Will, formed a group psychiatry practice in 1919. The Menninger Clinic as a sanitarium was established in 1925 with the purchase of a farm house and admittance of 12 patients. Their philosophy was that mental illness could be treated with an integrated medical, psychodynamic, and developmental approach for the total health of patients. The Dr. Menningers did not believe that the fate of mentally ill people was to be warehoused; they believed mental illness could be treated. The Menningers brought hope for troubled persons everywhere.